For many years I believed that Israel’s leaders have no equals in the business of saying one thing and doing another. But Mubarak has proved me wrong. He went on television to tell Egyptians that he would be staying on for some months because only he could restore stability and set the stage for it to continue after he stepped down. Hours later his thugs were leading a violent attack on the peaceful, pro-democracy protesters in Cairo’s Tahir square. What you describe in the footnote has been on my mind a lot, too! I'm a cynic. 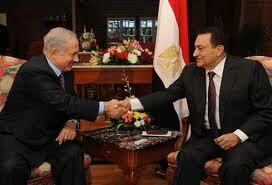 I think Israeli strategists wanted unrest of the type Mubarak's thugs were attempting to provoke. Their goal? Destabilizing the country, provoking a 21st Century Suez Crisis and bringing in foreign troops to keep "order" in Egypt--leaving Israel free to attack Lebanon (whose Hezbolloah government it suddenly seems little concerned about), Syria and Iran. The Egyptian military would be effectively neutralized. Israel might even be able to reoccupy the Sinai in the confusion as a necessary move to protect itself from the Egyptian unrest. Fortunately, I think the Egyptians have seen through this strategy as evidenced by the Army's suppression of the organized provocateurs. Now that the cat is out of the bag, the Israelis are suddenly screaming about the "sacred" peace process--which its illegal policies have virtually destroyed. The al-Jazeera revelations show a grovelling PA accepting conditions even beyond the "chicken coops" Bill Clinton tried to impose--and being spurned by their Israeli counterparts! Now the world is being called on to "guarantee" Israel's 1979 peace with Egypt? Or we might see a "Hamasistan" in Egypt. The real fear being that a friendly Iran and Egypt might pose a real military threat. Just read the Neocon former UN Ambassador John Bolton's comments in the N.Y. Times (on Raw Story). He says Israel will have to move up its timetable for attacking Iran if Mubarak falls. I guess their thinking is no longer a big mystery. If Mubarak is succeeded by Omar Suleiman, the Egyptians will fall from the frying pan into the fire. Suleiman has a long relationship in Israel with its Mossad. As Mubarak's security head - and torturer par excellence, his rise to dictatorial power would no doubt suit Netanyahu - and the CIA. This would be a tragic outcome for the Egyptian people. "Dictators" do not dictate, they obey orders. Given that the orders come via Washington, London and Tel Aviv, how do the Egyptian protesters confront that? And given that US presidents, British PMs and Israeli PMs are themselves puppets, doing as they are told, how do the people of this planet - let alone the Egyptians - deal with that? Yes, some nations - like Iran - have broken the shackles. They are immediately branded as 'enemies', vilified, undermined, threatened with war. Particularly if they are seen as 'important' to western interests. Beware the nice words from David Cameron, Hillary Clinton, Obama et al. This is all an illusion! What do you think about this apparent contradiction between Obama urging Mubarack to "degage" and the Zionit State government wanting the dictatorship to continue ? Is there any strategic chess game between Obama versus zionists in Washington ? Was Obama clan planning for the uprises in Tunisia & Egypte ? So that to restore US authority over Nethanyahu and the zionist state ? Again and again we keep hearing "the US this, the US that". For heaven's sake...tell the Yanks to pack and leave. It is the US that is at the root of all this, supporting a dictator for so many years and in all these years never bothering about Egyptians' human rights or anything else. Two-faced and forked tongues...that is what the Americans are. Police provoking peaceful protesters? Sounds like the U.K. recently. It wouldn't surprise me at all that British, American and Israelis are behing the Egyptian problems, we Brit's at any rate have been stirring it for hundreds of years, we're good at it, and the Israelis are even better. The Americans are catching up, though a bit too obvious, too gung ho, no subtlety. There is going to be much trouble because of it, as the middle eastern races catch on, they will start to get angry and begin to chew on the tails of western Lions. (Iran) I certainly hope so anyway, and I hope those in charge of our countries right now get the worst of it. I just heard the NATO commander on BBC news telling us that the troubles in Tunisia and Egypt will interfere with local economies, that more illegal Arab immigrants will try to enter Europe,and that this was a timely reminder to NATO not to lose sight of security. This is perhaps the agenda for world peace, USI style.